"You would never guess there's avocado in these creamy, chocolatey, nutty ice pops made with tahini and soy milk. They are vegan to boot!" Combine soy milk, avocado, chocolate syrup, tahini, vanilla extract, and stevia in a blender; blend until smooth. 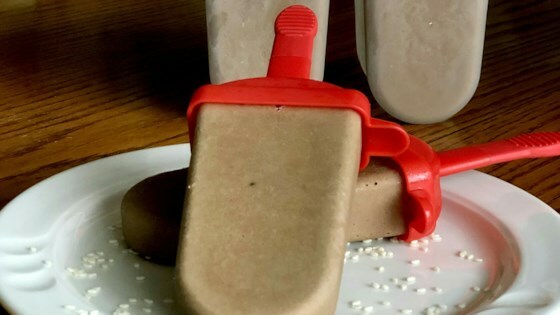 Pour into 4 ice pop molds, and freeze until solid, at least 4 hours or overnight. Any nut milk can be substituted for the soy milk. I think this dessert tastes like it's flavored with cough syrup.